Note: This biography has been used with permission from Paul Noll, author of the Noll Family Genealogy. Born: 01/25/1932 in Cleveland, Cuyahoga, OH. Married: 05/25/1957 in Cleveland, Cuyahoga, OH. Noll was a former University of Dayton co-captain and a starter on University of Dayton's only Division I team to play in the post-season. Noll is the only pro coach to win four Super Bowls, but long before anyone dreamed of a Super Bowl, Noll was a standout offensive lineman and linebacker for the University of Dayton Flyers. He was a part of Dayton teams that set school records for net offense (3,731), first downs rushing (115), fewest net yards allowed (1,954) and fewest net rushing yards allowed (946). Those records have since been broken, but remain University of Dayton's Division I highs in those categories. Chuck was a team captain in 1952, and graduated from the University of Dayton in 1953. He, subsequently, was selected as a charter member to the University of Dayton's Athletic Hall of Fame in 1962. The University of Dayton's football team went 7-3 in 1951, and played in the 1952 Salad Bowl. Dayton lost to Houston 26-21 in Phoenix, Arizona. After seven seasons with the Cleveland Browns, Noll spent nine years as an assistant coach with the Los Angeles Chargers and Baltimore Colts before being named head coach of the Pittsburgh Steelers in 1969. He was the NFL's youngest Head Coach with Pittsburgh in 1969. Following his selection as head coach of the Pittsburgh Steelers, Noll's team won their very first game and, then, proceeded to lose the next 13 games in the season. The following season his team won 5 games and then 6 games in 1971. The winning ways continued, and, by 1974 his team won their first Super Bowl. 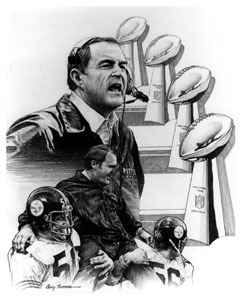 Super Bowl wins in 1975, 1978, and 1979 made the Steelers the team of the decade. Noll's 23-year record of 209 wins, 156 losses and 1 tie is the sixth-highest win total in the history of the NFL. He retired in 1991 after 40 years in professional football as a player, assistant coach and head coach. Chuck Noll was enshrined into the NFL Hall of Fame, Canton, OH, for his outstanding performance as an NFL Head Coach. He won four Super Bowls during the 1970's for the Pittsburgh Steelers. He was enshrined on July 31, 1993 in Canton, Ohio as the only NFL coach to ever win four Super Bowl championships (1975, 76, 79, 80). Quoted in The Atlantic magazine as having said, "Every element of the human body is contained in a slice of pizza." The reporter was so awe struck, he did not dare question the great NFL head coach about what that statement really meant.